The U.S. has been in the habit of sanctioning the hell out of Russia as of late, and U.S. House Democrats and Republicans are set to do it again—this time over something President Donald Trump swears didn’t happen at all, which was meddling in the 2016 U.S. presidential election. But regardless of how he feels, Trump has little choice but to sign it. What Does The Sanctions Bill Do? The bill, as the New York Times reports, is designed to punish Russia for meddling in the 2016 election as well as for its invasion of eastern Ukraine and annexation of Crimea. It would target actors in Russia suspected of providing weapons to Syrian President Bashar al-Assad’s government and “those undermining cybersecurity, among others,” according to The Times. Over the weekend, Democrats and Republicans worked out what will be tough economic sanctions against North Korea and Iran. The most devastating aspect of the proposed bill, which is expected to be announced tomorrow, is that it will limit the president’s ability to terminate or suspend sanctions. That is a very telling move for several reasons, starting with the fact that his own party doesn’t trust him to exact sufficient punishment against Moscow over its Ukraine actions and election meddling. It makes sense. The White House has signaled that it wants to lift sanctions to foster better ties with the Kremlin—which at the very least is not a great look, given that key members of his administration and campaign are under investigation for colluding with the Kremlin. Either tomorrow or later this week, we’ll know the fate of the bill, but it appears to be a continuation of Obama’s robust sanctioning of Russia that began in 2015. Go figure. Why Does It Put Trump In A Precarious Situation? Trump has long refused to accept the intelligence community’s assessment that Russia tried to interfere in last year’s election to ensure his victory. To do so would tarnish his victory and further worsen the tumult his White House is enduring over the independent Russia investigation into his campaign. Though, none of that can delay the inevitable. 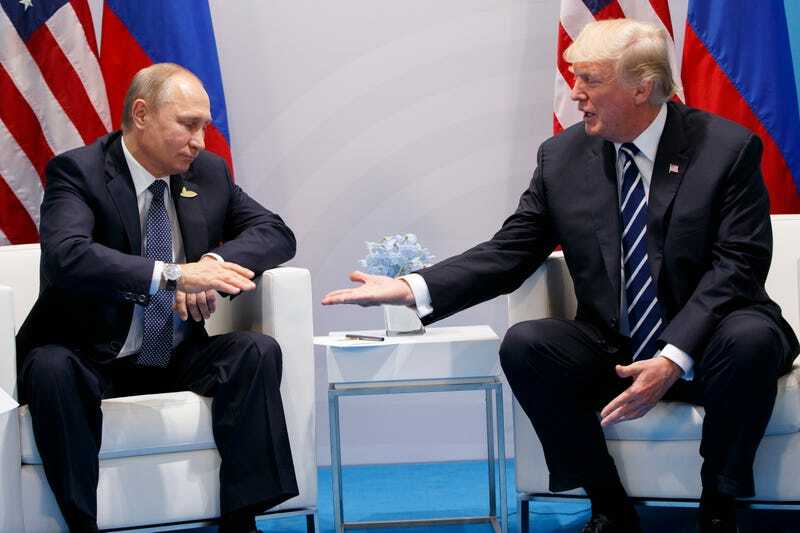 If Trump vetoes the bill, he’ll be railed even further as some kind of accomplice to Vladimir Putin most Democrats have accused him of being and sharply criticized for upending a signature Republican foreign policy effort that’s earned Democrat support. If he signs as expected, it’ll make his relationship with the Kremlin much more difficult and undermine his own arguments that Russia did nothing wrong in 2016. Indeed, he doesn’t have a lot of options this time. One issue is that it certainly will not put him in the good graces of Putin, whom he needs to have a working relationship with. Trump would be correct to express such a concern. Even Obama had that fear when Congress insisted on passing the Magnitsky Act to penalize certain Russian officials suspected of involvement in Sergei Magnitsky’s death in a Russian prison in 2009. Moving forward with the act, Obama felt, would hamper his “reset” efforts with Russia and so he resisted supporting the bill for months. Now, we’re talking about Trump here, but any U.S. president will struggle to negotiate effectively with a foreign leader when his own government is dropping stiff sanctions on his country. Though, the irony of Trump’s dilemma is glaring. He boasted during the primary that he’d have a great relationship with Putin, severely under-estimating that a signature highlight of Republican foreign policy is toughness against Russia. Though Obama levied the most aggressive sanctions against Moscow since 1991 over its actions in Ukraine, Republicans felt he didn’t go far enough. Many in the GOP—and even some Democrats—advocated for Obama to arm Ukraine with lethal weapons, a call he poured hot water on. Trump may be playing a dog and pony show at the White House, but the GOP won’t let him do that with its foreign policy. Economic sanctions already are hurting Russia’s economy as it is. Any further economic pressure could make it worse, and make Putin play hardball on other issues such as nuclear non-proliferation, cooperation in Syria and resolving the Ukraine crisis. Not to mention, it’ll make Trump look weak. He’ll be seen as someone who can’t even control his own party. That doesn’t bode well with Putin, who has a Duma that rubber stamps his policy wishes with little pushback. Who Wins With The Bill’s Passage? The bill will leave the Republican Party on pretty good footing. Six months ago, it would have been harder to get this bill through Congress because the GOP was far more in force rallying around Trump, even if some members did not like him very much. Trump still has a very supportive base and resisting him could hurt certain members of Congress’ reelection chances in their home districts. But Trump’s position is a lot more precarious now. A day hasn’t gone by without major coverage suggesting that he or his campaign may have worked with Russia to aid his victory over Hillary Clinton. This bill will, in some ways, make it appear as if Republicans are separating the party from Trump, and still allow its leadership to support the White House. Russia, North Korea and Iran will be sanctioned and the GOP will keep its tough foreign policy billing. House and Senate leadership can say they stood up to the president all while supporting his beleaguered presidency. It’s a compelling strategy. Then again, this is Trump and he could very well veto it because, well, he’s Trump and he does unpredictable things. Even if he does veto it, the GOP can say it tried and Trump’s White House looks like the Russia shill, not Republicans. It’s win-win for the GOP and pretty much a lose-lose for Trump.